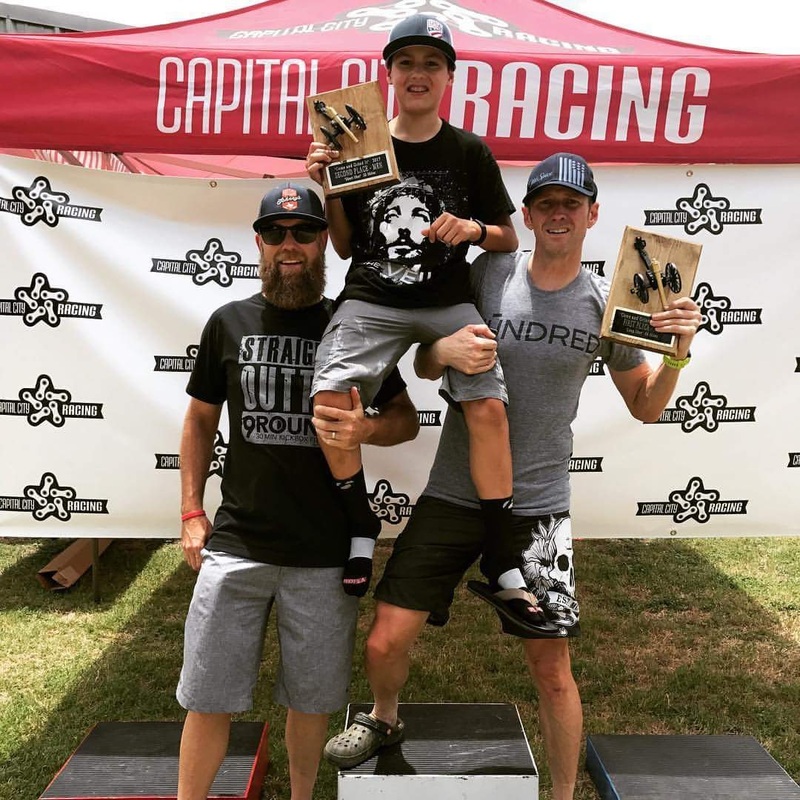 Capital City Racing Has Texas Gravel and Cyclocross Covered! Interested in getting your business involved with Central Texas cycling events & promotions? 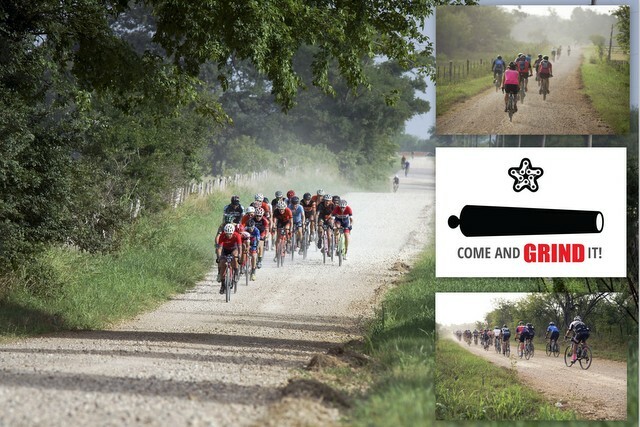 We'll just go ahead and say it... this is the hardest 100k gravel event in Texas! Join us for either a 37mile/50+k, or a 62mile/100k route. The 100k features just 14% pavement! 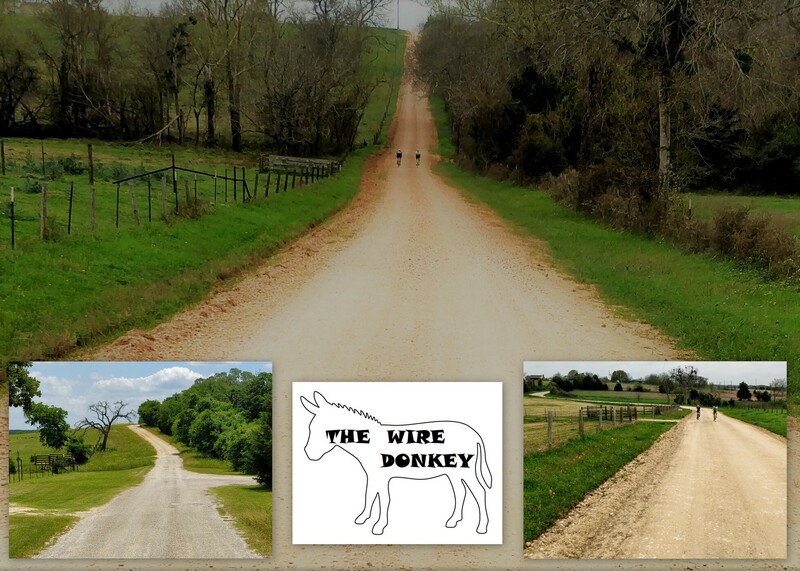 Rolling hills across amazing countryside, and heavy gravel conspire to make this one tough donkey! These routes just don't let up and riders will be pushed hard all the way to the finish line. Those cold Austin Beerworks brews at the finish line party will never taste so good, while you enjoy a great lunch, music, and fun at the beautiful New Ulm Fireman's Park! Also special thanks to our friends at Orange Seal Cycling, Austin Beerworks, and Brad Houston Law. See you at the 2019 Wire Donkey! This is an amazing event on a mix of gravel roads, with just 19% pavement, and followed up with a seriously challenging section of sandy roads out on Sand Hill and K & L roads! What will the sand roads present for 2019? Racers and good time riders get to choose the Short Whizz or the Long Whizz for 34 or 65 miles! Then enjoy award winning artisan pizza and iced tea/adult beverages at the finish line party with our hosts the Whizzerville Hall! Special thanks to our great sponsors Brad Houston Law, Orange Seal Cycling, and Nuun Hydration! See you at the 2019 Whizzerville Hauler! Check out the amazing 2018 images from Austin Vivid! See the 2018 results here! The "Come And Grind It" returns for the 3rd year in beautiful Gonzales County! This is a great event that is perfect for beginners, cruisers, and racers alike! The route has everything on a 33 mile loop with just 5% pavement, a great mix of fast and heavy gravel, scenic winding roads, and a few kicker stairstep hills coming into the finish line. 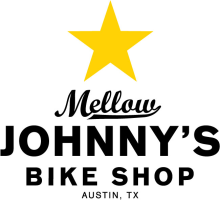 Choose one (Short Shot) or two laps (Long Shot), and then enjoy a great lunch at the beautiful grounds of the Leesville Association and adult deliciousness from Austin Beerworks at the best after ride party in Texas! We'll have tables set up course-side with Nuun and water for racers to refill, or stage bottles/nutrition on before heading out on a second loop. You'll appreciate a special finish line worthy of your ride, and featuring professional chip timing from DoMore Races. Special thanks to sponsors Nuun Hydration, Orange Seal Cycling, Austin Beerworks, and Brad Houston Law! See you at the 2020 Come And Grind It! Check out the 2019 'Come And Grind It' photos here! Check out the 2018 event photos here! Join us for this challenging and fun event in Stockdale, TX! Choose between 15 mile, 33m/50k, and 68m/100k routes that feature a great variety of scenic gravel, sand, and quiet country roads. Like all of our events, we value the real deal, and the 68 mile route is 80% gravel! We'll have a great lunch waiting for you at the picture perfect finish line, featuring professional chip timing from Domore Races. Race it hard or cruise it slow, no matter what you'll have a great time! Special thanks to our friends at Orange Seal Cycling, Austin Beerworks, Brad Houston Law, and Nuun Hydration! See you out there at the Stockdale Gravel Roundup! Click here for the 2018 photos from the Stockdale Gravel Roundup! 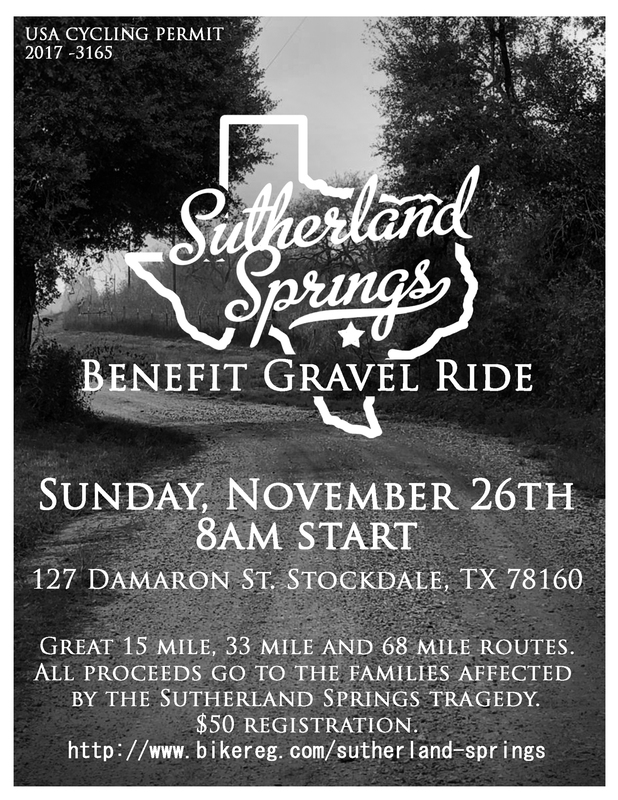 Great video from Random Rides and Ruminations at the 2017 Sutherland Springs Benefit Ride that started the Stockdale event! 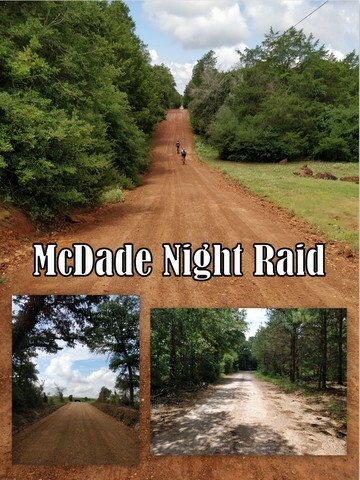 This was a fun night of riding on an amazing mix of quiet gravel and paved roads out of McDade, TX on a Saturday night! There was 37 and 54 mile options to choose from that cruised through the beautiful landscape of Bastrop and Lee Counties. We started off in historic 'downtown' McDade about an hour before sunset, and then enjoyed music, beer, and fun at the finish line. Take a look for a return of this fun time in 2019! Click here for the GPX/TCX files for the event! Thanks to everyone that came out to support us for this great gravel grinder ride! With your help, we raised just over $7,500 that went to the Spirit of Giving Fund set up by HEB Grocery, directly benefiting the families impacted by the Sutherland Spring shooting tragedy. Three great distances to choose from: 15, 33 and 68 miles on fully marked/signed beautiful, primarily gravel roads. 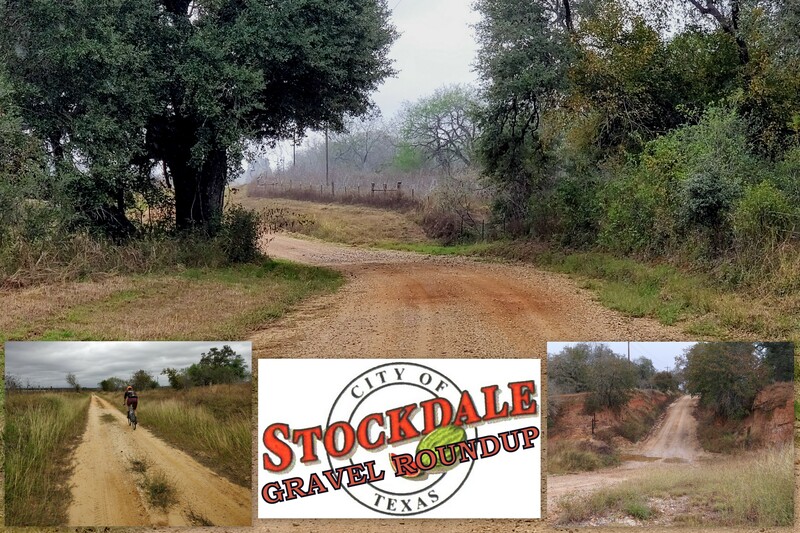 This course will be returning in 2018 as the Stockdale Gravel Roundup! This racer and fan favorite started in 2012, and has regularly set attendance records year after year! Held the first weekend of October at East Metropolitan Park in Manor, TX (20 minutes outside Austin), this event features fast power sections, a steep run-up, and a winding course that wraps around the beer garden and sand pit. The Lucha Libre Single Speed Championships is always a great way to cap off the Saturday's fun, and you never know what shenanigans will happen in this zip-tie conversion/ride what you brought race! Started in 2015, the 'Cross of Ages' has quickly become a fan and racer favorite event held at Richard Moya Park in Austin, TX the weekend before Halloween! Yes, costumes are highly encouraged! This event features a fun and challenging course with off cambers, climbs, fast sections, and sand! This is a very spectator friendly venue where fans can see the whole race unfold in front of them from the beer garden on the top edge of the grassy bowl! The new finale headliner event Lucha Libre Single Speed Championships is also a real crowd pleaser, and not to be missed. Oh, there will be more gravel for sure. 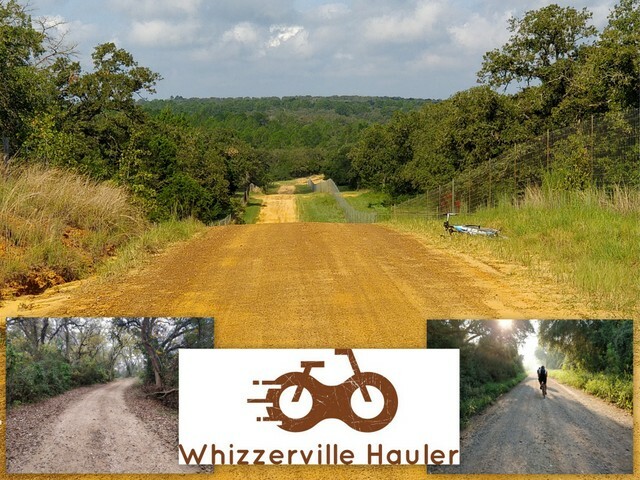 On July 1st 2017, Capital City Racing put on its first gravel ride/race in Leesville, Texas. Look for more events to come from Capital City Racing in the gravel! This is a Capital City Racing exclusive, that brings the Lucha Libre flavor and mayhem to a special single speed cyclocross and mountain bike category. This race/ride is an open, no racing licenses required class. Shirtless men and women with bikini tops are called up to the front of the start line by their official luchador names. Look for the final event photos to come soon! 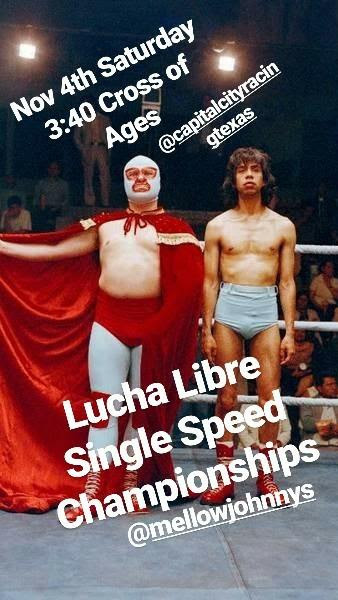 Here are the unofficial rules: please don't ruin the course tape or cut the course tape, no Lucha Libre capes while riding (choking hazard), helmets are required. No motorized bicycles. No backbrakers, brainbusters, chokeslams, facebusters, neckbreakers, piledrivers, diving bulldogs, diving clotheslines, moonstar or frankensteiner moves are allowed. Brett Kinsey of Capital City Racing Texas would like to tell you that he's got a new website that is under construction and please don't send him any feedback on Facebook until this website is done or he might freak out.